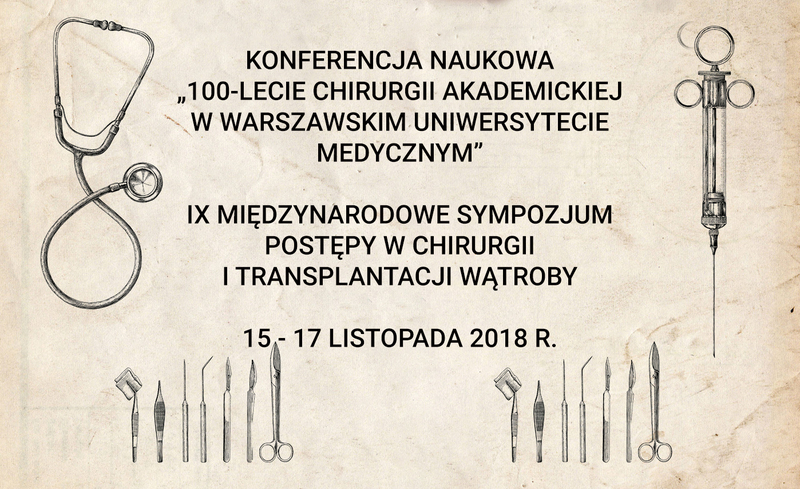 This year’s edition is quite special, as it coincides with the Centennial Jubilee of the 1st and 2nd Department and Clinic of Surgery, whose history goes back to 1918, when the two Departments and Clinics of Surgery were established within the structures of the Faculty of Medicine of the University of Warsaw. To celebrate this special occasion, a historic jubilee session will be held on 15 November at the Didactic Centre of the Medical University of Warsaw, devoted to the past and present achievements of both Clinics. The 9th Symposium on Progress in Liver Surgery and Transplantation, first organised in 1996, has become a regular fixture in the calendar of academic conferences bringing together specialists from different fields, notably liver surgery, bile duct surgery and liver transplants. Because of its broad scope, it is also of interest to professionals specialising in hepatology, gastroenterology, infectious diseases, radiology, oncology, anaesthesiology, pathology and bacteriology. At our Conference, we will be hosting many well-known and accomplished experts and specialists from leading hepatology, nephrology and transplantology centres, as well as vascular centres, from both Poland and abroad. The high rank of the event is reflected by the fact that previous editions, just like the upcoming one, enjoyed the scientific patronage of such prestigious societies as the Association of Polish Surgeons, Polish Transplantation Society, as well as ESOT, ELITA, E-AHPBA and many others.